Posted by Ada Wang on 4/19/2019 9:23:50 AM. Somebody asked how to remove DRM from kindle topaz books. Here is the full guide for removing topaz DRM and converting topaz files to epub, pdf etc. Topaz is an Amazon format for Kindle devices. It differs from the AZW format in that as it can have embedded fonts in the file itself. A .tan sidefile is used to store metadata and bookmarks and other user generated content on the eBook. The metadata is used to help the library mode to reference information about the eBook itself. While not much is currently known about the internal format used in a Topaz file is that, there is some likelihood that it is related to the standard AZW format. It uses a different compression than standard MOBI files and it can have embedded fonts in the file allowing more complex display using font sets and characters that are not standard to Amazon Kindle. It is also likely to remove other restrictions found in MOBI files such as image size limitations although some of these may have been removed in AZW as well. According to one publishing industry blogger, Topaz is an implementation of the open EPUB standard. It follows the OEBPS 2.0 specs, and probably the later IDPF guides. It’s a proprietary implementation which means they use ePUB as the source but then convert it to their internal format. AZW1 - an eBook in the Topaz (TPZ) format that has been delivered via Whispernet. TPZ - an eBook in the Topaz format that has been delivered via Internet download. 1. Authorize your copy of Kindle for PC and "Sync and check for new items". Install Kindle for PC and authorize your copy. 3. 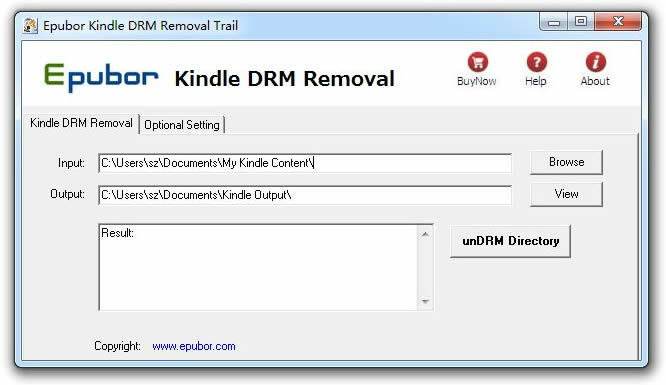 Run TPZ DRM Removal to remove drm from kindle(topaz , tpz, azw1). Browse for input directory, default as "..\My Documents\My Kindle Content\". Epubor Ultimate can help you remove DRM from AZW,AZW1, PRC, Mobi, TopAZ(.tpz) books with ease, which requires you to set the "Optional Setting". where ... varies by platform but is "Local Settings\Application Data" on XP. After removing topaz/azw1/tpz DRM, you can use Calibre to convert books files, Download the best ebook converter Calibre. Topaz: I used the tools on a Kindle file, and got back three files instead of one. Which one is the de-drmed ebook? The Topaz file format contains two versions of the book plus a composite xml description of the book. The _SVG file is a zip archive of the scalable vector graphics (svg) image of each page of the book. Each image is comprised of a list of glyphs and positions. It is pretty much an exact copy of the original book, but made of up of images, not text. The second version is the text version, unchecked by human eye. It contains the usual kinds of errors you’d expect in OCRed text. This is the version used to create the HTML “_nodrm” zip archive. Neither DeDRM nor Calibre are causing the errors – the errors are in the OCR stored in the original ebook. The third file contains the XML files which truly are the Topaz internal format. If you want to understand this format better, unzip this file and open any of the xml files with a text editor. You can import the HTML version (_nodrm.zip) into Calibre to convert it to epub, mobi, etc as it is easily reflowable and convertible but it may need spellchecking and hand editing to clean it up the OCR errors. You can also import the set of SVG images into Calibre or other PDF creation software and convert them to an image-only based PDF.